As one of the most important Orthodox thinkers of his time, Rabbi Joseph B. Soloveitchik (a.k.a. the “Rav”) frequently combined classical Talmudic concepts with insights drawn from the great secular thinkers of Western Tradition. The ensuing synthesis of his thought makes his theological worldview existential and challenging to Jews of all denominations. Unfortunately, in his lifetime, the Rav never wrote a systematical commentary on the Torah. However, Dr. Arnold Lustiger, surveyed the vast corpus of the Rav’s writings and put together one of the most remarkable Pentateuch commentaries I have ever read. The name of his magnum opus is entitled, Chumash Mesoras Harav – Chumash with Commentary Based on the Teachings of Rabbi Joseph B. Soloveitchik – Sefer Bereishis. This volume speaks in a single voice—a rarity when one considers how committees of scholars typically write most of today’s contemporary expositions on the Torah. In another well-known passage in the story of the Fall, God informs Eve that her husband shall exert authority over her (Gen. 3:16). I would add that the subjection of women described by the Rav is not necessarily a new phenomenon as the Rav thought it was. Men have been using the biblical text to justify the institution of patriarchy for thousands of years. The exploitation of women in much of the Islamic and Ultra-Orthodox world today reflects a social reality that derives its inspiration from Genesis. While most married Orthodox women cover their hair, the Rav’s wife did not. The Rav respected his wife’s choice to embrace a post-Genesis social reality where women would never have to show their inferior social status ever again. The disappointing experience in Egypt did not discourage Abraham from pursuing his original goal: the total redemption and conversion of mankind. He returned to the site where he had built the altar before his journey to Egypt and there he called on the name of God. The universal ideal was Abraham’s loadstar. Persecution, ridicule, indifference, opposition, loneliness—none of these experiences discouraged him. Dr. Lustiger’s book has hundreds of profound existential and ethical teachings that will never exhaust the imagination of the reader. Our generation owes Dr. Lustiger a debt of gratitude for organizing the Rav’s writings in a manner that will inspire a lively reading of the weekly Torah portion for families and communities alike. 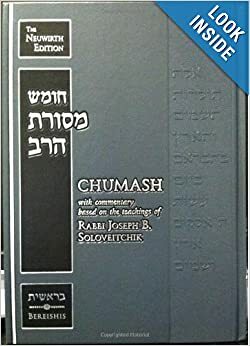 Arnold Lustiger, Chumash Mesoras HaRav (Sefer Bereshis): With Commentary based upon the teachings of Rabbi Joseph B. Soloveitchik (New York; OU Press, 2013), 61-63. It sounds almost as good as your commentary.